← A Closer Look by the ECPIP Staff… Gender Effects in the 2013 NJ Gubernatorial Election? The holiday season at the end of the year is usually a time for cherished traditions, and to follow suit, we are continuing our tradition here at the Rutgers-Eagleton Poll by reflecting on our top results of the past twelve months. 2012 proved to be an exciting time for polling in New Jersey, but 2013 certainly did not disappoint – between two statewide elections, countless pieces of important legislation, a national government shutdown, rebuilding after Sandy, and a whole host of social issues that stood at the forefront of politics both state and nationwide. The Rutgers-Eagleton Poll explored several of these topics this past year, so as another year comes to a close and as we raise a toast to 2014, here is a look back at five of what we consider to be the top polling stories in New Jersey of 2013. 5.) Much like the rest of the nation, support for gun control in New Jersey declines post-Newtown. In the week following the tragic Sandy Hook Elementary School shooting in Newtown, CT in December 2012, support for gun control reached an all-time high – 77 percent of Garden State residents were “very concerned” about gun violence in the country. 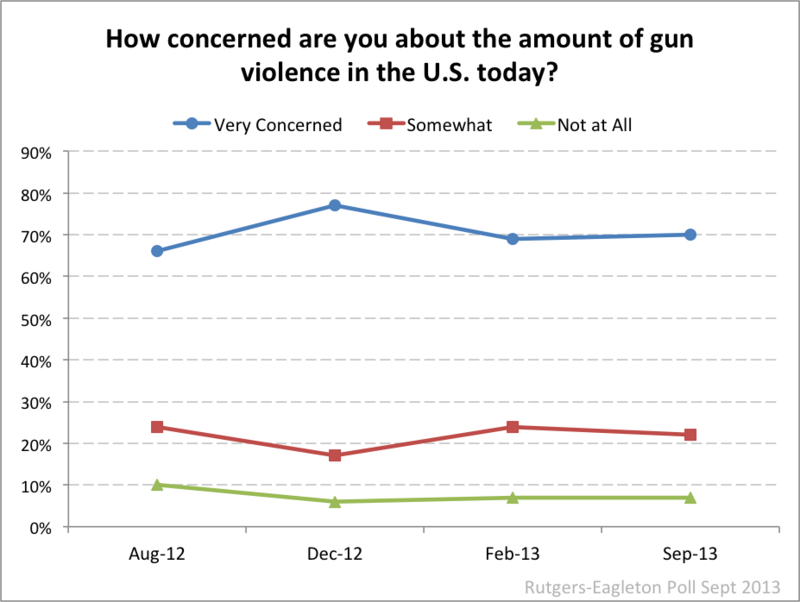 But with the arrival of the new year, this spike in concern quickly dissipated, receding to pre-Newtown levels. In February 2013, the percentage of those very concerned dropped to 69 percent, and the same percentage said it is more important to control gun ownership than to protect gun owner rights – also a slight dip from the 72 percent who believed controlling gun ownership was more important in December. Just before another tragic and highly publicized shooting at the Washington Naval Yard this past September, 70 percent were very concerned about gun violence and 63 percent favored gun control over gun owners’ rights (a six point drop). Nonetheless, most New Jerseyans supported gun control legislation, particularly the three pieces Gov. Christie either conditionally or absolutely vetoed that same month. The governor subsequently signed one of these into law shortly thereafter – the reporting of lost, stolen, and discarded guns to federal databases – alongside 11 other bills he signed in the weeks prior.